These sweet potatoes are delish! Caramelized on the outside and soft, steamy and tender on the inside. You can have fun with the spice factor by increasing the amount of cayenne, using a little hot sauce or chili powder! These pair really well with one of these dips, particularly the chipotle one! Coat the sweet potatoes in coconut butter and arrange on a baking sheet so that they are not touching one another. Bake for about 15-20 minutes until just starting to soften. You'll be able to just barely stick a knife through them. In a small bowl, mix the spices together. 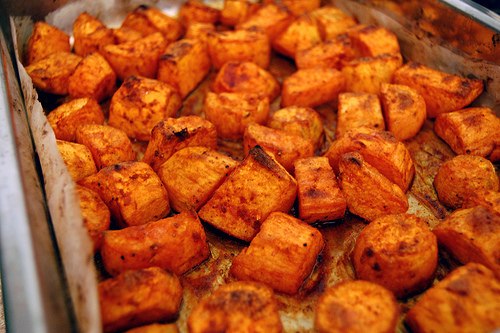 Sprinkle the sweet potato chunks liberally with the spice mix. Depending on the size of your potatoes, you might not need all the mix. Use your judgement. Mix well. Increase oven temperature to 475 degrees and continue to bake until golden and caramelized. About 10 minutes. Make sure to check on them in that 10 minutes and stir them once or twice to prevent the bottoms from burning or getting too dark. Sprinkle with a little sea salt before serving these hot taters!